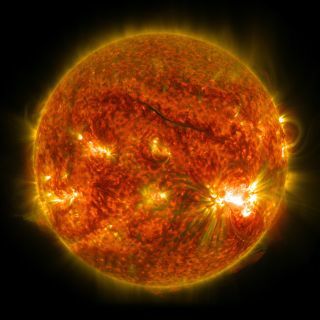 Solar flares captured on the Sun. On August 4, 1972, the crew of a U.S. Task Force 77 aircraft flying near a naval minefield in the waters off Hon La observed 20 to 25 explosions over about 30 seconds. They also witnessed an additional 25 to 30 mud spots in the waters nearby. On August 15, 1972, the Commander in Chief of the U.S. Pacific Fleet, Admiral Bernard Clarey, asked about a hypothesis that solar activity could have caused the mine detonations. I was on my first sabbatical leave at NOAA working with Wallace (Wally) Campbell's group, and one day in Wally's office I noticed a group of U.S. Navy brass hat gentlemen and a couple of dark suits. The outcome of this investigation, as stated in the declassified U.S. Navy report, detailed "a high degree of probability" that the Destructor mines had been detonated by the August solar storm activity. Solar flares captured by NASA and ESA.